Retirement assisted living is designed to offer comfort and the feeling of independence to senior folks while at the same time ensuring that they have access to any help that they might require in order to improve the quality of their lives. Be that as it may, many senior people and their loved ones find it difficult to embrace the idea of assisted living. We will offer a brief discussion on some of the common myths associated with assisted living with a view of enhancing your understanding of the benefits of this form of living. This is not true. Community homes recognize the need for privacy and independence. This is why you are offered your own private space, your own apartment and you have the freedom to furnish it to your own liking. Furthermore, you are the one who controls access to your apartment since you are the only one with the key to the apartment. This is also another myth cannot be further from the truth. Assisted living homes have a properly trained staff available to address any needs of the senior ones on a 24-hour basis. There are also facilities such as in house telephones and alarms that are designed to enable you alert the staff members in case of any emergency. This is also another myth that is not true. Seniors living in assisted living communities are much more active. This is because such communities have many programs and activities such as gardening, fitness programs, bingo, book clubs and many other such programs designed to ensure that you are able to engage in your favorite hobby while at these homes. The main objective of assisted living is therefore to offer you with comfort and companionship during old age with a view to enabling you to cope with any challenges that might come with old age. For senior citizens, an assisted living community can offer a better quality of life, social life, and wellness than living in their own homes. Here’s a look at why. Of course, this leaves us with a huge problem. As mom and dad begin to need more and more help with their daily care, it can put serious strain on family relationships and caregivers. This is when assisted living may become the answer that fits everyone’s needs. It keeps your parents out of “a home,” while you can rest assured that they are well taken care of. In an assisted living community with 24-access to personal care, as well as wellness services and nutrition designed especially for older adults, senior citizens can thrive. They’ll enjoy the support, security, and social contact they need, while retaining their independence. Senior assisted living is the perfect intermediate step for seniors who require more help than can be provided at home, but don’t necessarily need the 24/7 medical care they would receive in a skilled nursing facility. Here are eight reasons to consider senior assisted living for the quality of life and health of your loved ones. 1. They offer a safe environment. Assisted living facilities are designed specifically to offer accessibility and mobility, which helps prevent accidents and falls, yet they also quick help in the event of an accident. For seniors living at home, costly modifications may need to be made if their physical health begins to decline. Two examples are the addition of a medical alert system and shower railings. 2. They provide access to physical fitness opportunities. Many assisted living communities offer the latest gym equipment, personal trainers well versed in the specific needs of older adults, and even exercise classes, such as Zumba and yoga. This goes well beyond the physical fitness opportunities they would have living at home. 3. Transportation and housekeeping needs are taken care of. The responsibilities of daily life, including house cleaning, landscaping, and getting to various appointments can become a huge burden for the caregivers of older adults living at home. An assisted living facility takes care of almost all these needs. Typically, upkeep and housekeeping is included in the monthly rent and many facilities offer transportation services. 4. There are plenty of chances for social activity. For seniors, especially those who live alone, living in their own home can be very isolating. In assisted living, socializing is easy. Not only are there common areas, but they also frequently host planned activities, including cultural events, dancing, and field trips. 5. They offer help with activities of daily living (ADLs). When seniors live at home, their family caregivers often take on the responsibility of assisting with their ADLs, including bathing, eating, and dressing. In other instances, the family chooses to hire a home health aide to come in and provide these services. Either of these options can result in personal and financial strain. In an assisted living community, helping older adults with their ADLs in a basic tenet. This allows them to get the help they need, while maintaining as much independence as possible. 6. They supervise nutrition. When seniors are living at home, it can be almost impossible to manage their nutrition. They may not have any desire to cook and family caregivers may not have the time to come over day after day to ensure they are eating a healthy diet. Assisted living communities feed residents three meals a day tailored to their specific health needs. 7. They provide intellectual stimulation. Assisted living communities frequently offer all types of learning activities, ranging from computer and art classes to book clubs. It’s not unusual for facilities to offer guest lectures from visiting professionals and scholars. In some cases, when a facility is near a college, residents may be able to take advantage of campus resources, including cultural events and courses. 8. Independence. For most seniors, being able to maintain their independence, while still getting a little bit of extra help now and then, is the biggest reward they gain from assisted living. Meanwhile, families appreciate knowing their loved ones are well taken care of. Not only does this reduce everyone’s stress and improve family relationships, but it also allows adult children to spend meaningful quality time with their aging parents. Choosing the right elderly assisted living community for your loved one is important. With each elderly assisted living community being so unique, it’s best to tour several facilities and ask critical questions to determine which is best for your loved one to ensure proper care, safety, and quality of life. To help you be prepared to ask those important questions, use the checklist included below as a guide in order to get the most out of your visit to each center. If the questions here inspire more questions or concerns, include those as well. Feel free to adapt this list to your own needs and those of your loved one. What’s the ratio of staff-to-resident? What experiences and credentials are required of staff members? How many are staffed during overnight shifts? Is there a nurse available 24/7? Are all staff members authorized and properly qualified to administer medications? Is the staff experienced with the diagnosis and condition of your loved one? Is there an initial assessment prior to admission? What variety of apartments are available? What is the monthly rate of the apartments? Is there a wait list and, if so, what’s the policy? How many are already waiting? What can be said about some of the current residents? What is the policy for discharging patients? Are there additional services available in the event a patient’s needs change? What is the policy for payments and billing? Does the monthly fee include all charges? Are there additional services available or charges to expect beyond the monthly fee? What types of patient activities or other interactions are to be expected? What is the safety policy and how is it enforced? Taking care of a dementia patient, is neither an easy task for the dementia caregiver nor for their families and loved ones. Most are the times that many families take to assisted living, at this point. But the main question is, if one is able to identify signs, that it is the precise moment, for their loved one to take up to assisted living? Here is what a psychologist had to say about getting to identify and understanding these signs. According to a report by the Alzheimer’s Association, people channel lots of energy and time to taking care of one of their loved ones, who is suffering from Alzheimer disease or any other dementia. However, the unfortunate at times ends up happening, where the caregivers find themselves facing a financial crisis, they find themselves in a situation where they too suffer from an illness, as they bear the burden of offering home health care to their loved ones. This is the point at which one needs to evaluate the option of moving their loved one into assisted living, if their health care demands surpass that which can be handle comfortably at home. The decision of moving one’s loved one into assisted living is never, a walk in the park, however there are the significant signs that should act as an indication to the caregivers to notify them that the time is right to seek assisted living. Those with dementia often exhibit sexual, violent, as well as physical aggressiveness, and this may result in resentfulness from the family members and the caregivers. When they are getting to that state, then it is a clear indication that it is time consider the placement option. When the caregiver starts to experience increased stress levels, then it is as well a sign of the already described dementia behaviors. A critical question that a caregiver needs to ask themselves is: “Is the patient’s needs getting beyond what you can handle?” or “Are you putting your health as well as that of the person with dementia at risk?”. It is at this point that the family needs to have the tough sit- down and come to an agreement. One needs to evaluate their ability of taking care of their loved one and the safety of the patient in their current home. An agitated conduct of the person with dementia, which intensifies as time goes by, referred to as “Sundowners syndrome”, is a common behavior among dementia patients, and this can go a long way in frustrating the caregivers. This can become unbearable among the family members, as it increasingly disrupts their routines, which is a clear indication that the caregiving is becoming a burden. When dementia patients get to the later stages, they may often wander off, when not under surveillance from their caregivers, even for a second. This puts the patients at increased risk of falling and getting serious injuries. A New York Times publication covered the psychological implications that may occur to a caregiver, as they go about to make tough caregiving decisions, some specialists even compare this, to the effects of post- traumatic stress syndrome. According to John Wright owner of Westminster Lodge Mackay, he not only attributes these signs to the pressure of taking care of someone with dementia, but also on the disruption of the caregiver’s eating, sleeping patterns, which is as a result of too much of their attention and time been dedicated to giving care to the patient. He backed this up by saying that, when the brain is constantly on the alert, so many things will take place, as one is not going to eat properly and one’s nutrition levels will drop and so will their health. For spouses of those requiring care, the effects of the caregiving, which are physical, emotional, as well as mental can be more pronounced. A recent example is the primary caregiver who is the wife is 80 years old, and taking care of her 85-year-old husband, something which is quickly draining her too. In a recent incident the man fell and the wife was unable to pick him up, and she had to call for ambulance aid. In such instances it is out rightly evident that the needs for care have become too much for the caregiver to bear, but in other cases it might not be that obvious. If one starts to get feelings of resentment, isolation and loneliness, as the caregiver, then there is urgent need to find out where they are emanating from. What If My Loved One Requires More Care than I can Provide? It is a tough decision to choose between home health care for one’s loved one versus assisted living, and this results in guilt and grief in the caregivers, as moving their seniors out of their homes, isn’t easy for them to deal with. We end up losing our loved ones twice: first to the disease, and the second when they are no more. The caregivers get into a dilemma, whether they did enough or should have put more effort, they may experience separation anxiety at the thought of relocating their loved one. In the case where there are strenuous family dynamics, for instance in the case, a caregiver, who had an unhappy childhood, is giving care to a parent, these may end up making the decision process be more problematic. Thus the need of pre- planning for this. In the early stages of a loved one’s illness, it is necessary to first get all the paperwork together and ready. She said that, it is the culture of most people to shy away from talking about those things. However, before the dementia starts affecting the person’s cognitive health, it is vital to have a close person, be it a family member, physician or friend, help the person to get together the right paperwork, and make the vital decisions. This will go a long way in easing the process of moving one’s loved one into assisted living, when that time comes. The best one can do for their loved in the case of moving them into care, is to ensure that they are moving them to a place where all their needs will be adequately and efficiently met. One should make pre- visits to the communities they intend to move their loved one’s before settling for any of them. They should ensure that there are appropriate medical support facilities, as well as activities for dementia patients, in those communities. Rita says, that one should keep in mind that, once they have done their research properly, their loved one is going to thrive wherever they will send them to. One of the best ways in which one can be in a position to give support to their loved one as a caregiver is by staying healthy and strong, as a caregiver it can at times be difficult to find ample time to take care of your senior, not even mentioning even oneself. If one is taking care of some at home, then organizing a brief shift breather, is a way one can get some time off to rest a bit and build up your strength. One should also be keen about their mental health, and having a circle of support such as friends or other family members, to offer a shoulder to lean when times get difficult is also advisable. There is therapy, counseling and support groups, at the disposal of family members who are through changes relating to dementia and Alzheimer’s. One should check with the intended community one’s loved one is moving to. Most of them, have caregivers’ support groups, and also offer other family resources. These resources, can go a long way in making one realize that putting one’s loved one into care is for the best of their loved one as well as for themselves, in terms of happiness and health wise. We need to realize that, as human beings we have limitations, as we can only offer so much at the expense of our health. Most of the population today would prefer to stay in their family homes despite there being other options like independent and assisted living communities. This population has come to this decision since they feel like they will lose their independence. However, research carried out by AARP and MetLife Mature Market Institution shows that staying in the family homes is not the best with regards to the family budget and overall happiness or quality of life in our golden years. Well, the fear of losing independence has been overcome by baby boomers who have reinvented assisted living communities where these communities have expanded their markets by providing convenience and retirement services. Why Independent or Assisted Living May Trump Living Alone. Gone is there adage where assisted living was perceived as your normal grandma’s nursing home, since today there are a myriad of assorted amenities available in these communities. These services include but are not limited to barber services, beauty services and spas. Due to these services as well as other social activities, the old are realizing that the independent and assisted living communities are providing convenience, happiness and improved quality life unlike them staying in their homes. Starting as well as keeping and maintaining a family home can be expensive especially when relying on a single fixed income. This is so because of the costs that accrue from minor problems in the house such as leaking roofs or blocked kitchen sinks which arise from time to time since they can’t be predicted at all. The fact of it being expensive to maintain a family home when relying on one fixed income has been backed up by MoneySense Magazine which says that a single person needs approximately 70% more income than a couple depending on two fixed incomes to cover typical home expenses. Hence leading to a lot of strain and stress to the one depending on a single fixed income which is no longer necessary due to the availability of independent or assisted living communities. One’s behavior can start to deteriorate if one’s always alone and begin to feel depressed. These communities provide social interaction to the aged which reduces the chances of depression. They also help the aged not feel out of touch with the world especially through outreach programs established by the independent and assisted living communities that enable the aged be involved in the community where they work with children, NGOs or even businesses. They feel alive and not neglected. The assisted living communities engage the aged with programs that keep them active throughout the day. These programs include strength building workouts, water aerobics, gardening etcetera that keep their blood circulation flowing and their bodies remain healthy and strong unlike them staying in the house all day long doing nothing. Let’s have a reality check first and foremost. When you are alone in the house you are not social at all. You keep to yourself. Is it not more socializing being in an assisted living community with people not only of your age but also people sharing your interests? It is inevitable that as people age they become less creative hence no amazing plans like when they were teenagers but that shouldn’t worry you anymore. With the assisted living communities, they plan continuous social events for them depending on their interests hence able to keep up their socializing skills. Are your senior ones reluctant to consider the idea of assisted living senior village? This is an opportunity for you to help them overcome their fear of assisted living senior village. Bringing up the issue of assisted living might be difficult at first, be that as it may, it is important to have a candid discussion with your senior ones regarding the need for assisted living. The most effective way to establish whether or not assisted living is the best option for your loved ones is to actually visit an assisted living community and find out the nature of its services. John Wright, owner of Westminster Lodge Mackay asserts that indeed the main challenge that one can experience with respect to assisted living is reluctance. It is quite easy to assume that everything is fine with our loved ones until that point when we take the time to actually visit them and appreciate their living conditions. With most senior people, you might find that they need help with their day to day activities or in other cases, our parents and senior loved ones might need assistance living as an escape from the solitude of their homes. Despite the apparent need for assisted living, your loved ones might still be reluctant to embrace the idea once you bring up this topic. In order to address this challenge, both you and your senior loved ones can visit assisted living homes since such an approach will enable them to have the emotional support they need while considering the idea of having to live away from their homes. Furthermore, Mr Wright suggests that visiting assisted living communities with your loved ones before committing them to such homes will enable them raise any concerns that they might behaving regarding the services offered and when such concerns are addressed, they will be less reluctant to commit to such communities. One of the reasons why it is also advisable to visit assisted living communities is that such visits can enable you appreciate the services offered and this information can be quite handy in the event of an emergency. This is because, even if your senior loved ones refuse to accept to commit to a community, you can contact an assisted living centre that is close to their homes in case of an emergency. This can only e possible if you have actually taken the time to visit such communities, obtain their contact information and understood the nature of their services. According to Mr Wright, the most appropriate time to visit assisted living communities is during social events. This is because, during such events, the mood is quite relaxed with people having fun while wining and dining. Such social events can therefore serve to ease any tension on the part of your senior loved one thus increasing chances of acceptance. ou can also share the tips on how to overcome reluctance and helping your senior loved ones on up to the idea of assisted living. Surprise and dismay is a common state when shopping for supported living community for your dear one. We often hear the renounce that is costly than residing at home. Supported living can at various situations cost more than living at home, but in many cases, total supported living costs are considerably less than in-home care costs. Price depends greatly on home demand and supplies the same way it does in any market for goods and services or real estate. In remote areas in explicitly, supported living charges may be higher than average as a result of the low availability of housings. In densely populated areas, charges may be greater than usual as a result of high costs of staff salaries and real estate. Although the location is an essential factor in supported living costs, many other deliberations can take part in the outcome. In the same area, a 400-sq ft studio high-rise will apparently cost no more than a 1,200sq.ft two bedroom. Supported living locals do not require the equal level of attention. Those who require extensive services will often pay more than those who need assistance with fewer aspects of everyday life. Upon moving in, supported residing societies usually charge a non-refundable administrative fee. The fee caters for everything from renovating his or her building to getting the new local registered in services. It is always good to keep in mind how much daily expenditure is included in the charges when weighing supported living against home care. Rent or mortgage: By shifting to assisted living, existing home owners will besides do away with property tax and insurance costs. Utilities: Assisted residing charges cover all services outside cable and phone, as well as water, garbage, heat and air conditioning, sewer, and electricity. Maintenance: You will no more have to contract housekeeping services or yard work, and you will not have to pay for emergency repairs. Most of the assisted residing amenities even provide linen service and assistance with laundry. Food: Meals take a considerable portion of many people’s budgets, accounting for almost a third of entire monthly expenses. In many of the assisted residing plans, two or three meals are included per day. Household help or individual care: Hiring assistance for $10-25 or more per hour can go up quickly. At home medical care can be more expensive. Westminster Lodge Mackay owner John Wright says that in several cases, supported living is equal to residing at home financially. The value of life is an essential difference. For most seniors, living in a lively, engaging society with several everyday opportunities for social relations and leisure is a receivable change of pace. Most adults residing at home reduce entertainment as a method to put aside money. Mr Wright states that with an elderly residing at home, the monthly budget has a clear space next to social leisure. Usual social activities keep the elderly sharp and fit, they regularly equal the dissimilarity between flourishing and surviving. According to Mr Wright, grown up children should take care of their parents’ present way of living. Do both individuals get to stop working in this house? How did mother’s life adjust when father retired? Did it improve or did it get bad? We are still dealing with an era where mothers didn’t get to stop working, so we are handling with a value of life. The adult communities have changed a lot in recent years. If you have not visited for some time, you might have a little misunderstanding. Today’s elderly communities do not feel organisational. They range from a cruise ship to smart luxury of a high-end lodge. Many of the elderly after shifting to independent living societies or supported living have reported that they favor life at the communities to live alone. It is not easy to maintain a home particularly for those who have developed physical illnesses. Activities such as shoveling snow, climbing a ladder to switch bulbs, vacuuming, and pulling weeds become history. However, don’t be bothered green thumbs because the residents are willing to take on a backyard. Locals at a senior living community do not need to be bored as everyone is covered. Both home community and on-site activities and entertainment are provided. Entertainment can vary from visiting performers and musicians to day tours that might incorporate a trip to the nearby art museum, forays into nature, or local attractions. Adult people often become reliant on their close relatives or grown-up children, for the assistance of all types. Both parents and their children can have unhealthy feelings caused by the strange role reversal imposed on their relationship. Younger folks are set free from the responsibility of around the clock caregivers and can guarantee that time with their adult loved one is important and high value. Adult locals are happy to go back to the role of family head and often glad that their adult children no longer have to parent to look after. Many residents at elderly societies used to live alone and were eating poorly. The locals at elderly living societies don’t have to be bothered about food preparation, coffee brewing or grocery shopping. But they get a chance to benefit from an exceptional dining experience throughout the week. Substitute food is always provided, and the meal tastes sweet. Special diet needs can typically be contained. It is evident for new locals who had not been eating right prior to moving in, to see improvements in their healthiness and well-being simply from three square meals in a day. Our driving capabilities may not be the same as before, and they get tense and demanding as we get old. Therefore, many locals prefer to make use of the free transportation that is offered by independent and supported living societies. Even if there is parking for locals who still drive, there is no need to depend on a car anymore. We may not be capable of capable of taking part in activities and games that we liked, that used to assist us to keep sharp and were fun. However, elderly societies provide lots of opportunities to keep us busy. This includes favorite pastimes such as bridge and poker, chess, interesting lectures and classes on every possible topic, and engaging reading groups and debates. The elderly who live by themselves get isolated which is not healthy regardless of the age. At elderly societies, we can share food, make buddies, and have the benefit of festive events with each other. In contrast, those of us who are shyer are grateful that our confidentiality is valued but are still happy to have people around. Locals can feel at ease being aware that they are safe and protected from con men, thieves, and everything else. Additionally, they enjoy the calmness that comes from the instant response systems that are in each residence or at times on the local’s person as an ornament. This lessens fears about failing and getting ensnared for hours or days, a situation that is all too familiar for elderly living alone. Some adults are just fine residing alone. We know that adult societies are not for all. However, there is no doubt that there are huge numbers of adults residing alone in dangerous or harmful situations who would profit greatly from life at an elderly community. Most older Australian home owners on low incomes could achieve a modest retirement living standard over the remainder of their lives by drawing on their home equity. Equity release products (ERPs) are designed to enable older home owners to withdraw equity while still living in their homes. Most currently available products are reverse mortgage loans, and these are the only ERPs that are regulated at the federal level, but new non-credit products are also emerging in some jurisdictions. The market for ERPs is small and has stagnated in recent years — with 40 000 outstanding ERPs nationwide, they comprise just 0.4 per cent of the home equity of older Australians. This is due to both demand and supply side constraints. – Demand is impeded by consumer preferences affecting the family home and debt; negative perceptions of the products; poor financial literacy and information; high costs and risks; and disincentives arising from the tax and transfer treatment of the principal residence. – Providers and investors show little interest in the products due to the relatively small market size; the risks caused by the uncertain timing and value of returns; costly prudential and regulatory requirements; the lack of a consistent regulatory framework across ERPs; and the reputational risk inherent in offering the products. Some of these impediments are unlikely to change. They simply reflect underlying consumer preferences, the commercial decisions of funders and suppliers, and fundamental characteristics of the products themselves. Providers could partially address certain impediments through greater investment in promotion, more innovative product design, and competitive pricing. Government could reduce regulatory barriers by easing the more prescriptive regulations on reverse mortgages, and developing overarching principles-based regulation for all ERPs. There is little rationale for active government intervention in the equity release market in the current policy environment. Options for intervention could be carefully considered in the event of substantial reforms to tax and transfer policies affecting the principal residence. In general, the tax and transfer treatment of housing in Australia favours home ownership over renting and over investment in other assets. The exclusion of the principal residence from the means test for the Age Pension may encourage investment in housing at the expense of other assets, and provides a marginal disincentive for older Australians to downsize to a home better suited to their needs and preferences. – In principle, including the full value of the principal residence in the Age Pension assets test would improve efficiency and equity. – However, given that support for home ownership is embedded in many government policies and in people’s retirement planning, removing the exemption entirely in the immediate future is intractable. – At a minimum, there is a strong case on equity grounds for setting limits on the value of the principal residence that is exempt from the Age Pension means test. 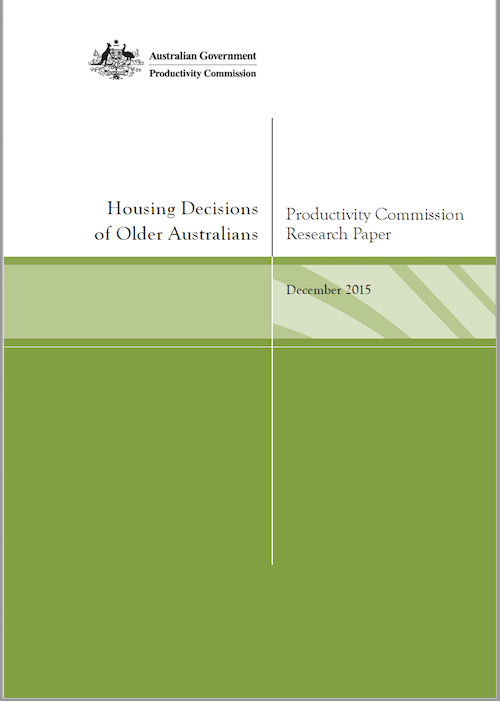 Stamp duties act as a barrier to housing mobility, and can discourage downsizing by older Australians. – Stamp duty concessions, which are available in some jurisdictions of Australia, may ameliorate some of the inefficiencies of stamp duties. However, they also raise concerns about fairness. – There is merit, on efficiency grounds, in making the principal residence subject to land tax and removing stamp duties on housing transfers. The inconsistencies in the treatment of assets across means tests for home care, residential aged care and the Age Pension result in mixed incentives, and are a source of unnecessary administrative complexity and confusion for older Australians — especially given that the means tests for the Age Pension and residential aged care are complex in their own right. • There are equity grounds for incorporating the full value of a resident’s former principal home in the means test for aged care.